Imagine a plant breeder receiving a shipment of seeds from a genebank only to discover that none of them would germinate. It happens. Seed genebanks are established to conserve biodiversity, but seeds are living things. They won’t germinate forever. Genebank managers need ensure that those seeds the distribute remain viable. Most genebanks conduct seed viability monitoring to ensure seeds in the collection will germinate. However, genebanks don’t want to waste their precious seeds unnecessarily nor the time of their staff. Genetic resource specialists at the International Rice Research Institute (IRRI) are rethinking our approach to viability monitoring and are suggesting some methods to improve the efficiency of the testing process. “With an ever-increasing number of accessions held in the hundreds of genebanks around the world, there is pressure to optimize management procedures and introduce efficiency measures that reduce costs,” says IRRI Genetic Resources Specialist Fiona Hay in a recently published article in Conservation Physiology. THE BIG QUESTION: WHEN SHOULD I REGENERATE? Genebank managers use viability monitoring to determine when the seed lots will reach the viability threshold. Seed viability declines slowly at first and then rapidly as seeds age. Genebank managers need to know when this decline occurs so they can take action to regenerate the accession. Regenerating involves growing a crop from seeds in the genebank and harvesting the seeds from the crop. If they wait too long, the seeds won’t germinate and the material can be lost. “The ‘holy grail’ of seed conservation research is the development of a non-destructive method for estimating viability,” says Dr. Hay. “But this still seems unachievable and genebank managers would probably not trust it anyway.” The traditional procedures to monitor seed viability can be costly both in terms of labor and the number of seeds used. Many genebank managers use non-optimal germination test procedures and inject sampling and scoring bias into their results. Dr. Hay and her IRRI colleague, Katherine Whitehouse, suggest options for overcoming these problems, including tolerance tables, sequential testing schemes, image analysis to score germination tests and seed storage experiments to rank seed lots according to their relative longevity. Standard procedures for testing viability call for using ‘replicates’, which basically means subdividing the seed sample into smaller batches. Almost invariably there will be variation in the germination results between the two replicates and a tester may be tempted to simply throw out the outlier. Hay and Whitehouse suggest that tolerance tables can be used to identify whether the whole test should be repeated. The tolerance tables can inform about the individual test result and suggest if any overall factors are causing dispersion in the results. Often the quantity of seeds available for viability testing is low. In those cases, and in cases where viability is expected to be high, Hay and Whitehouse recommend sequential testing schemes. The sequential germination test uses fewer seeds per replicate than the standard germination test. The germination test is done sequentially on replicates and stopped as soon as the results allow a decision to be made on whether regeneration is necessary. Hay and Whitehouse suggest starting with a smaller sample of seeds at first and only repeating the test if germination is too low. Test results are interpreted by humans and, no doubt, some degree of unconscious bias will be introduced. To reduce bias, the authors suggest turning a blind eye to historical data, outsourcing germination testing or using machine vision/image analysis. The Genebank Standards are somewhat open to interpretation in terms of monitoring intervals. Intervals that are too frequent will waste time, resources and seeds; intervals that are not frequent enough can lead to loss of material. Hay and Whitehouse present data from rice accessions which show that testing results are showing a loss in viability much quicker than predictions estimated using the seed viability equations. Analyses like this help in determining monitoring intervals. Seed storage experiments could be another way to ultimately increase the efficiency of viability monitoring. These experiments use a larger sample size and seal the seeds in moisture-proof packets, which are stored at relatively high temperature. Seed storage experiments allow managers to rank seed lots according to the time for viability to decrease a pre-determined percentile. A seed lot that loses viability quickly in the storage experiment will also lose viability quickly during conservation storage. A key component of viability monitoring is data management. Ideally, the viability monitoring data would be in the same database as other accession-related data. Both current and historical data can be used for decision making. Hay and Whitehouse caution against using viability data to understand relative seed longevity. The germination data span only a small part of the response variable and that makes the probit analysis of limited value. However, the authors suggest to look at the proportions of seed lots with germination of less than or equal to a critical value (such as 85%) as this will give a useful indication of overall performance of seed lots. Hay and Whitehouse have summarized a viability monitoring schedule by creating a flow chart of the decision-making steps to take while testing. 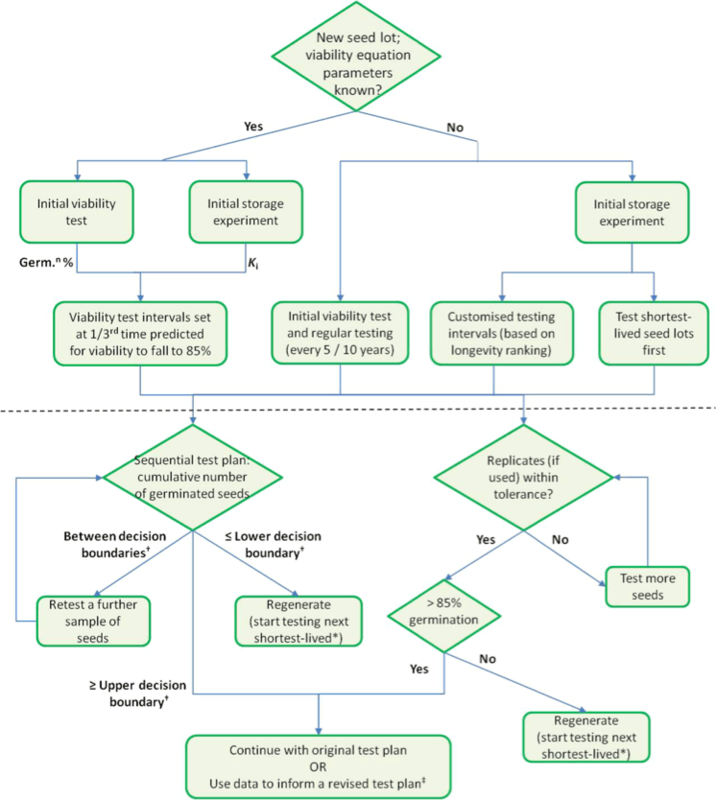 The flow chart can help managers determine intervals based on the predicted longevity and the initial viability test or the initial storage experiment.